Bus from Kuala Lumpur to Tapah is one of the important transportation option among locals. Bus service is still the preferred choice among the passengers to travel from Kuala Lumpur to Tapah even after launching of KTM ETS train service. Reasons are because bus supplies more flexible bus schedule throughout the day and offers convenient drop off point. Bus stops at Tapah town area for passenger easy drop off as compared to Train stopping at Tapah Road train station, which is 15 driving minutes away from town. Edaran Express, C.S Express, and Unititi Express are the only three bus operators offering bus from Kuala Lumpur to Tapah. Edaran Express is the dominant player by offering many choices of departure times to passengers. The bus schedule for bus from Kuala Lumpur to Tapah starting from morning 8:30am until evening 7:00pm. 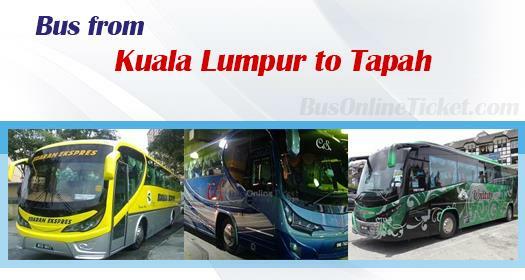 The duration required for bus from Kuala Lumpur to Tapah is about 2.5 hours. Please note that the bus arrival time is depends on the traffic and weather condition on your departure day. Washroom break will be given upon request from the driver during the journey. The bus fare is charged in the range of RM 12.40 to RM 17.00, depending on your choice of bus operator. Kuala Lumpur departure point is conveniently at Terminal Bersepadu Selatan, also known as TBS. Passengers can take public transport such as Monorail, KTM, Intercity bus or Taxi to get to TBS. Meanwhile, the arrival point in Tapah at Tapah town. Booking ticket for bus from Kuala Lumpur to Tapah is easy, reliable, and convenient. It saves you from hassle to travel to the bus terminal to buy ticket from the counters. You can go BusOnlineTicket.com, the most trusted online ticketing portal, to book your bus ticket to Tapah from Kuala Lumpur now.